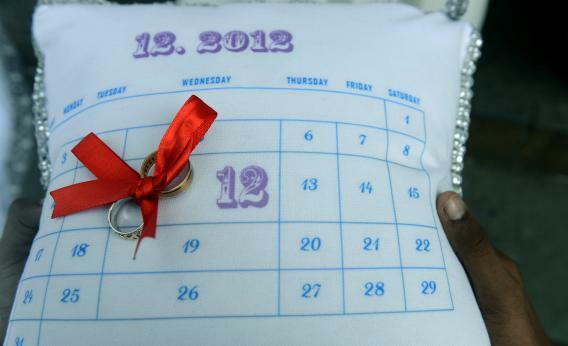 12/12/12: Where does it rank among the all-time coolest dates? Today is 12/12/12. Where Does That Rank Among the Best Dates Ever? Special-date enthusiasts Brandon Pereira and Emilia D’Silva celebrated their engagement on 10/10/10, had a registered legal marriage on 11/11/11 and finally had their big white wedding in Mumbai on 12/12/12. Hey, did you know that today is 12/12/12? Pretty cool, right? But not that cool. After all, if we’re honest, the full date today is 12/12/2012, which doesn’t quite have the same luster. Last year’s 11/11/11 hype—it even spawned a numerology-themed horror movie—felt similarly overblown. It happens every hundred years, people. If the devil were so into repeating numbers, why didn’t he rise on 11/11/1111? Now that’s a date. At this point you’re probably wondering, just how cool is 12/12/12? Is it even in the top 50? If we celebrate today, does that commit us to an increasingly dreary procession of semi-cool-date celebrations in the years to come? At what point does cool-date fatigue set in? On that last point, at least, you can rest assured: Today is the last repeating-number date of the 21st Century, even going by the cheaty two-digit-year format. Still, if we’re to avoid cool-date inflation, it’s essential that we some lay down definitive rankings. Herewith, the all-time top 10 coolest dates, according to universally agreed-upon standards of coolness such as roundness, symmetry, and coincidence with numbers of mathematical significance. Admittedly that list is a bit of a downer, since none of us were alive for any of those dates. And even the people who were alive on 1/1/1 didn’t know it was 1/1/1, since that date was established retroactively hundreds of years later. As consolation, here’s a list of the coolest dates that have happened or will happen within the lifetimes of people alive today. *Correction: This post originally listed 6/23/1023 as the tenth-greatest date of all-time. In fact, the tenth-greatest date is 6/02/1023—the calendar equivalent of Avogadro’s number.